Rear-mounted child bike seats are the most common method of riding with kids and babies, and for good reason. They are affordable, they fit on nearly any bicycle, and they accommodate a wide range of ages. 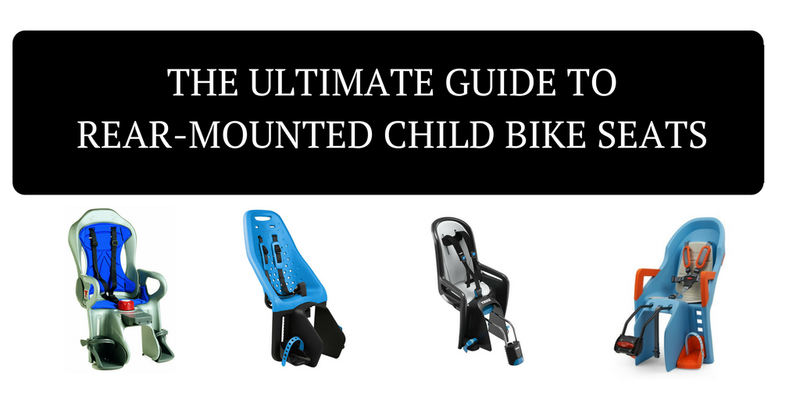 In this guide, I offer my favorite rear-mounted child/baby bike seats, tell you what to look for when shopping for a seat, and provide a comparison chart of many of the most popular bike seats on the market. If you’re just looking for a quick recommendation, see our list of the best bike seats up top. If you need more help knowing which seat will fit your bike and which will best fit your needs, read on. If you don’t want to spend a bunch of time researching bike seats, consider one of these seats. They are, without a doubt, the best rear-mounted bike seats on the market. The Thule Yepp Maxi is my top pick for rear-mounted bike seats. The seat comes in two versions—the standard Yepp Maxi that attaches to your bike’s seatpost, and the Yepp Maxi Easyfit that attaches to a rack. This flexibility makes the seat workable for (nearly) any type of bike. (If you’re not sure what you need, you can learn more about mounting options later in the article or in my review of the Yepp Maxi). Both versions of the seat come in an array of beautiful colors, are comfortable for the child, and have a long lifespan and good resale value. The Yepp Maxi doesn’t come with all the features of some of the other seats on this list (suspension, reclining, etc), but we actually appreciate the simplicity. No muss, no fuss. For more information, read our detailed review of the Thule Yepp Maxi. The Thule RideAlong offers an array of top-notch features—a reclining seat, suspension, and quick release bracket. That said, our favorite thing about the RideAlong is how easy it is to install, which can’t be said for many rear-mounted seats. The seat’s padding is machine-washable and reversible and it’s also comfortable. Speaking of comfort, we found this to be one of the easier seats for kids to fall asleep in. Unfortunately, there isn’t much of a curve around the top, so even when reclined, floppy heads can be an issue. The seat easily mounts to your bike’s frame (via the seat tube) and fits kids ages 1 to 6. 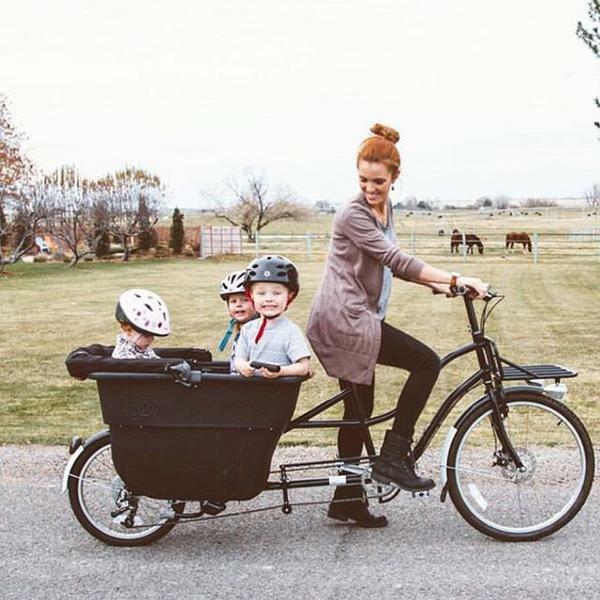 The Hamax Caress child bike seat is unique in that the back adjusts to grow with your child. Easily adjustable footrest and harness systems make further additional adjustments a cinch as well. We also like that a wide range of accessories (including a neck pillow and rain cover) make the Caress ultra-functional. Our one knit-pick with the seat, however, is that the neck pillow is almost mandatory due to the lack of padding at the top of the seat. The Hamax Caress can mount to either an existing rack or to your frame. Compared to many other rear-mounted bike seats, the CoPilot Limo is relatively easy to install and uninstall. It has nice thick, WASHABLE padding and a reclinable back. The only thing we don’t love about it is that the company offers limited replacement parts, so longevity is a concern. 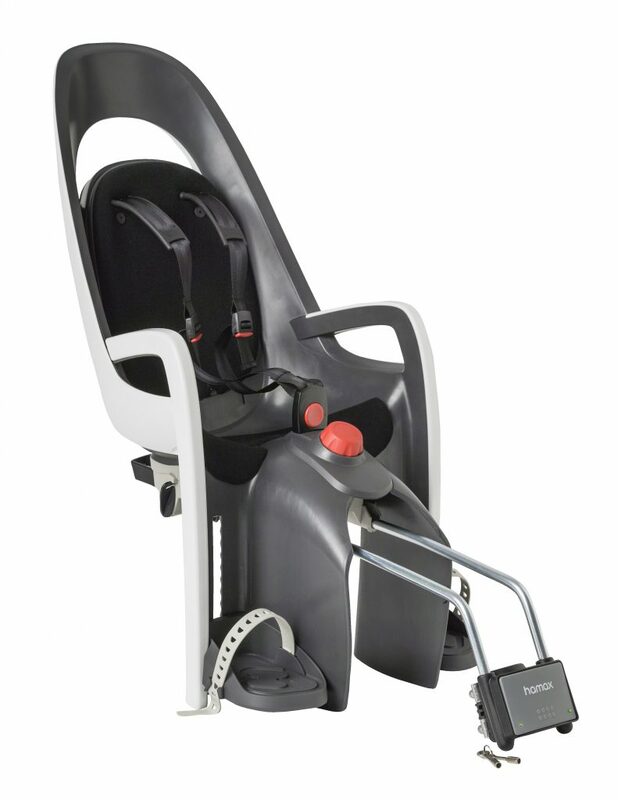 For more information, read our detailed review of the CoPilot Limo baby bike seat. If you don’t have a big budget, consider the Bellelli Pepe. For under $100, the seat offers durability and comfort. Little ones will appreciate the seat’s suspension, and parents will appreciate the highly adjustable shoulder straps. It also has a ton of ventilation which makes it a good pick for hot climates. While these seats aren’t our FAVORITES, they are worth a look–especially if you can find a good deal on one. The Polisport Guppy is a top pick due to its recessed helmet pocket (awesome for babies and toddlers) and super-quick installation and removal. A rear storage compartment is another bonus and provides ample room for diapers and snacks. Comes in both frame and rack-mounted versions. If you have a bike with disc brakes, the Topeak Babseat II is one of your better options. (It also comes in a standard non-disc version, so be careful with version you buy). Thanks to the included rack it also fits on a wide variety of frame sizes and geometries. One thing to take note of before buying, however, is that this is truly a baby seat. It works great for a 12-month-old but because it sits so close to the adult, it isn’t so great for a 3-year-old with long legs. The Bell Shell provides the bare minimum with no fancy bells or whistles. But for families who don’t do a ton of riding, this seat will do the job for quick Saturday afternoon jaunts. One word of caution, however: installation can be tricky and it’s a hit or miss on whether or not you’ll be able to fit this seat to your bike. If you manage, you’ll enjoy bike rides with your kiddo for a fraction of the cost of other seats. Here’s a comparison of the seats listed in my top 5 favorites list, as well as many of the other rear-mounted bike seats on the market. Seat Mounting MSRP Minimum Age Max Child Weight Reclines? But first: is a rear-mounted seat right for you?! Before buying a rear-mounted bike seat, spend a few minutes first deciding if it’s really the best choice for your family. Front-mounted bike seats have a special place in my heart. They provide a very special, bonding experience with your child that you don’t get with a rear-mounted seat. Unfortunately, they have a pretty limited life-span as the weight limit is usually around 30 to 35 pounds. 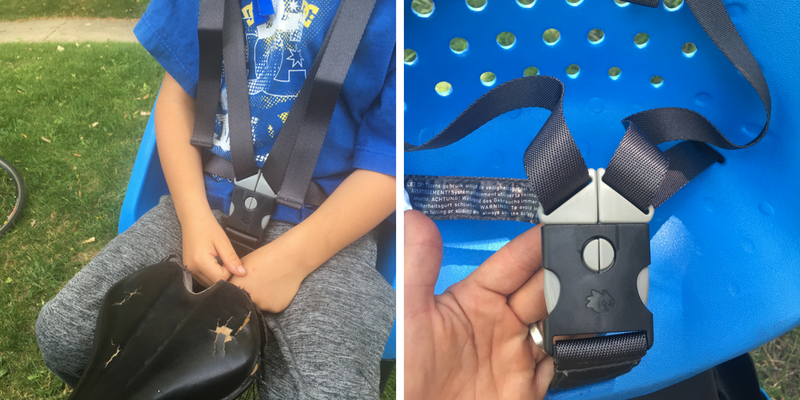 (If you have a child under that weight limit, you might want to check out my top picks for front-mounted bike seats). In addition to fitting a wider range of ages, rear-mounted bike seats are generally thought to be safer, and they work well with a large variety of bikes—cruiser, mountain bike, cargo bike, etc. 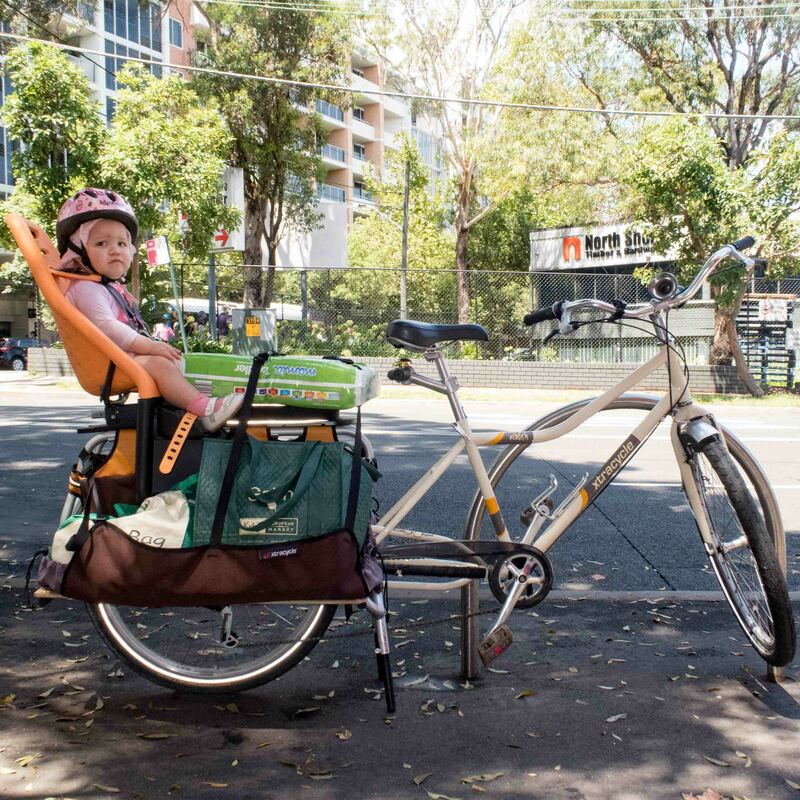 Have you thought about other options for carrying your child by bike? A bike seat may very well be the best option for your family, but it’s not the ONLY option. Other child bike carriers include trailers, cargo bikes, and more. People often refer to rear-mounted bike seats as “baby bike seats.” In reality, however, they are well suited for a wide range of ages. The Yepp Junior, for instance, will fit kids up to 77 pounds. As for whether bike seats are appropriate for babies is a matter of debate. They are certainly not appropriate for biking with infants. (Read When Can you Start Biking with a Baby? for more information). The American Academy of Pediatrics recommends waiting until babies are 12 months old. In other places (Europe for instance), it is more acceptable to bike with a baby once they have good neck control—around 9 months old. It’s up to your own good judgment and comfort level as when to start biking with your baby, but you’ll see several baby bicycle seats listed in the comparison chart above with a suggested age of 9 months+. Rear-mounted child bike seats are either affixed directly to the bike (via the frame or seatpost) OR they are attached to a rack. If you have a rack (or a long-tail cargo bike), this tends to be the easiest option. Even if you don’t have a rack, you can buy and install one easily. (Some bike seats even come with a rack). When choosing a rack, make sure that it has a high enough weight limit to safely carry your child—some don’t. I like the Topeak Explorer. Another awesome choice is to convert your bike to a long-tail cargo bike with the Xtracycle Leap. Beyond personal preference, you also need to consider the bike you are using and which type of mounting will work best. Which brings me to our next point…. Before buying a seat, you need to take a look at the bike that you want to mount it on. Frame Material: If you have a carbon fiber frame (which is generally only found on more expensive mountain bikes or road bikes) you don’t want to use a rear bike seat at all. Consider instead the MacRide or a trailer. Cable Routing: Does your bike have cables on the seat tube? If so, a frame-mounted bike seat won’t work. Consider a rack-mounted seat instead. Size of Your Frame: Generally, the smaller the frame, the more difficult it is to install a child seat. This may be remedied by putting the seat on the larger spouse’s bike, or if that’s not an option, then looking at a rack-mounted seat instead. Rack-mounted seats generally work better on very small bikes than do seatpost mounted seats. Eyelets: Most commuter and cruiser bikes have eyelets, while most road bikes and newer mountain bikes don’t. If your bike doesn’t have eyelets, installing a rear rack becomes much harder. There are seatpost mounted racks, but they generally don’t have a weight limit high enough to use with a bike seat. There are also special brackets you can use to install a rack, but we only suggest this if you have the time and know-how to figure it all out. Brake Type: Does your bike have disc brakes? If so, your options are limited. 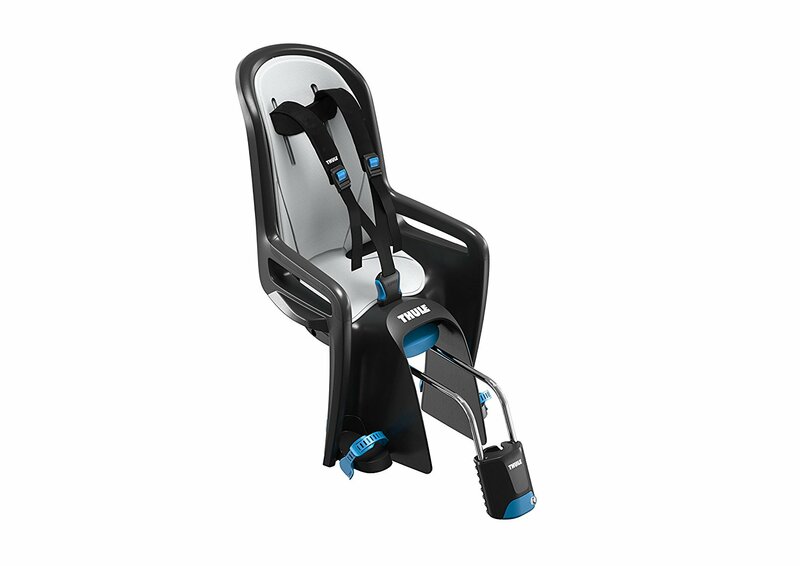 The Topeak Babyseat II is your best bet. Many rear-mounted child bike seats advertise a “suggested age range,” but it’s really more important to look at the maximum child weight. 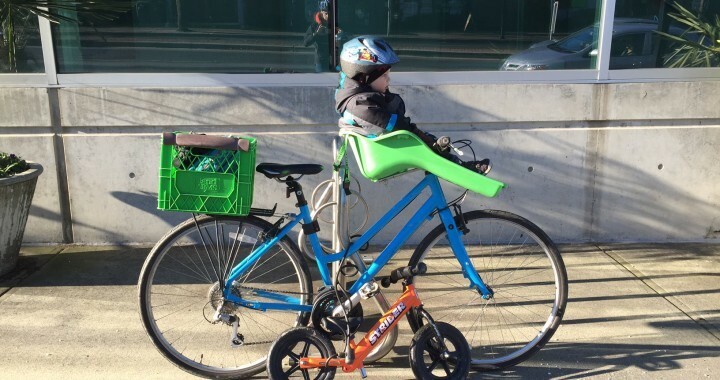 One child might max out a 40 lb bike seat at 3 and another at 6. Choose a seat that gives your child plenty of room to grow to maximize the value of your investment. Many of the more expensive rear-mounted seats recline. This is NOT a necessary feature, but certainly nice to have. For younger kids who are likely to fall asleep, the reclining seats also help keep their heads from flopping forward while they snooze. The weight of rear-mounted child bike seats varies quite a bit. As a general rule, lighter is better. You are already carrying quite a bit of weight in the form of a child; you don’t need to carry even more due to a heavy seat. Most seats don’t have suspension, but a few do. Namely, the Thule RideAlong and the Hamax Caress. Suspension makes for a more comfortable ride for your child especially if you tend to ride on rougher roads or unpaved rail trails. What makes a seat great versus just so-so is how easy it is to use on a daily basis. Strapping your child in is one of those things that really puts a seat to the test. You want the straps to be tight and secure on their shoulders and easy to buckle. Most rear-mounted bike seats have adjustable shoulder straps but some are easier to use than others. The Thule RideAlong, for instance, has some of our favorite shoulder straps. The height adjusts easily by sliding rather than having to re-thread the straps thru a higher holde. Considering that kids grow seemingly overnight this is a nice-to-have feature. Thanks so much for sharing your knowledge on this! It is super helpful ad appreciated. My husband and I have a 15mo kiddo and he’s looking to get into biking with her (I’ll tag along, but I still have random spills on my road bike in my 30’s, so he’ll be doing all the kid-toting). I want to get him a seat for father’s day, but here’s my rub, he has a basic road bike and a cooker mountain bike. We have some super mellow trails by our house and she loves hiking in them, so I have no doubt she’d love biking on them too! Is there one seat that does it all? Or is our best bet to do a thule ride along for the road bike and then an iBert for his mountain bike? I’m a bike moron, and trying to find people that do more than cruise with hybrids around town with kiddos is difficult! Thanks so much! I’m so sorry I didn’t see this until now! You CAN use the iBert on *most* road bikes and mountain bikes. We definitely used the iBert on our road bikes. That said, it’s not as comfortable on the road bike as it is on a more upright bike. I would give it a shot though, and then if your husband doesn’t like it on the road bike, you could always look for a second seat for that bike. You might also discover that he’s just more comfortable in general using a mountain bike when biking with your kiddo, even around town. I prefer it when biking with my son because it’s more upright, and easier to maneuver than my road bike. Thank you for this information. I’ve tried to post this question a couple of times and think there is a problem so apologies if it comes up more than once. I’m trying to decide whether to a frame or rack mounted seat. Is it possible to just change the connector used if it is not compatible with my bike or are the seats not interchangeable? I mean, if I get a frame mount and it doesn’t work, would it be possible to just get the rack for it or do I need a new seat altogether? Picking the right seat can be a little tricky. Some seats can be mounted either way but require an adaptor (the Thule Yepp Maxi is like this), but most can only be mounted one way or the other. If you have a bike with a rack already installed, this is a no brainer — go with the rack-mounted seat. Otherwise, just make sure you closely read the specs on the seat you want before buying. Most seats, for instance, will call out specific seat tube dimension that it can fit on. 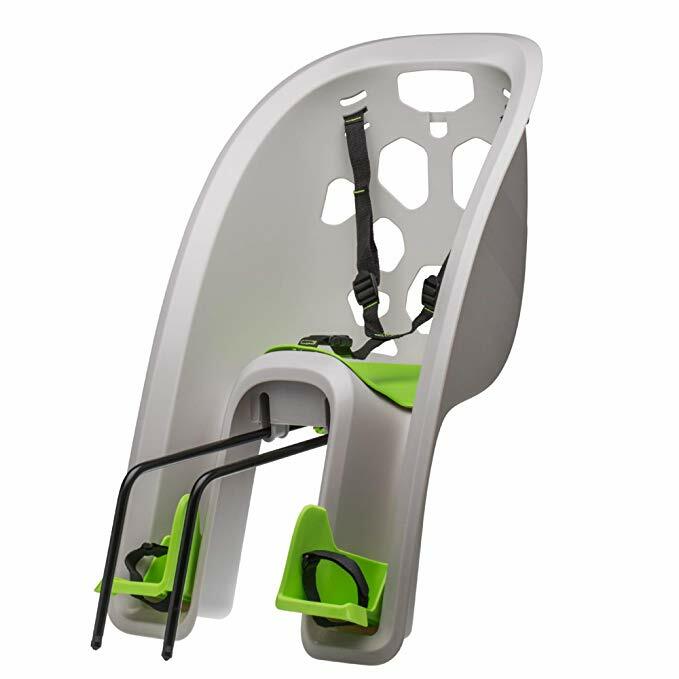 Can you attach a child seat, specifically the hamax caress, to any rear bike rack? I was looking at topeak rear racks but I was told that you’re not supposed to attach a child seat to them ever. Hi John, Good question. You do have to look at the maximum weight limit of a rack. Not all have a high enough weight limit to install a bike seat. 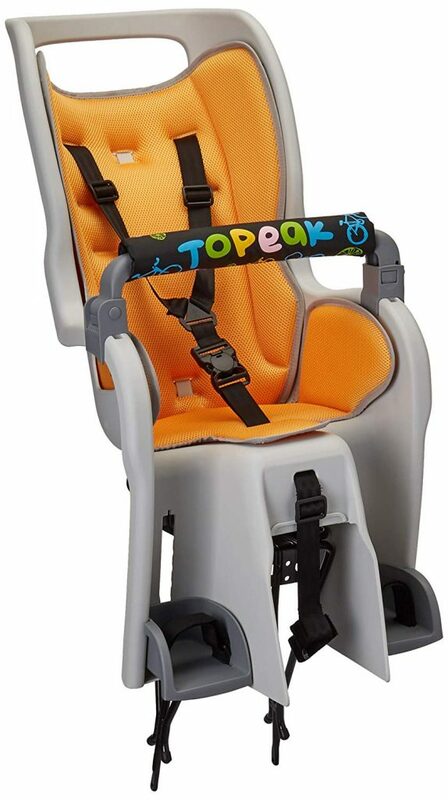 Some Topeak racks are ok for use with child seats. What rack did you go with for the Hamax? I just purchased one along with a Topeak Explorer rack, which meets the functional requirements listed by Hamax, but comes stamped with “not for use with child seat”. Very frustrating and can’t tell whether this means not for use with ANY child carrier or just Topeak’s child carrier. Any tips would be greatly appreciated! Hi Stacie, Due to the geometry on that bike, you are probably going to have a hard time fitting a seat. Depending on how old your child is, you might want to try a front-mounted seat like the ibert. Hey I see you wrote that a Yepp Junior holds 77 lbs but i can’t find that on line in product descriptions. Did I miss read? I have giant children and I’m looking for the best seat to hold lots of weight safely. Thanks for this post, it is so helpful!!! You didn’t misread, I can confirm the weight limit. You might be looking at the Yepp Maxi instead of the Yepp Junior? The Yepp Junior is a bit tricky to find in the U.S. but worth the effort. I appreciate your review of bike seats. I’m just wondering which of the rear mount bike seats can be swapped between bikes? We currently have the yepp mini and love it, but our son is pushing the weight limit!